A key component of Special Forces Operational Detachment "A"s (SFODA) being able to perform their mission is to get to where they need to go to do the mission. In many cases this involves a means of infiltration whether by vehicle, on foot, from the air (airdrop or air landing), or by sea. Graduates of the three-week long Airborne School at Fort Benning, Georgia are awarded the U.S. Army Parachutist Badge. Airdrops by parachute is a primary means of infiltration for SF ODAs. A pre-requisite for Special Forces is to be Airborne qualified. Fort Benning, Georgia conducts the three-week long Airborne School. The first week is Ground Week, the second Tower Week, and the third is Jump Week where the course culminates in the students conducting five parachute jumps. The parachute jumping continues throughout the SF students training and his entire SF career. Most SF Soldiers average 5-15 parachute jumps a year. Some many more jumps each year. US Army Airborne School. by WikipediA. HALO jumpers from B/1/20th NC in Feb 2013. Photos (top and right) by SGT Lindley Bess of 382nd Public Affairs Detachment. 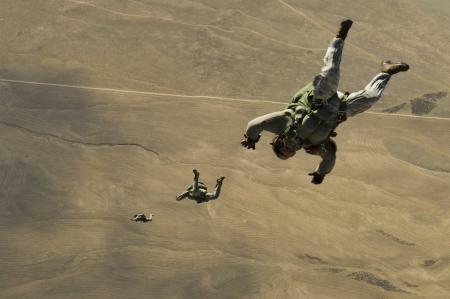 The Military Free Fall course will soon be part of the Special Forces Qualification Course (SFQC). Future plans are that all SF trainees will attend the MFF course over the next few years. 1. 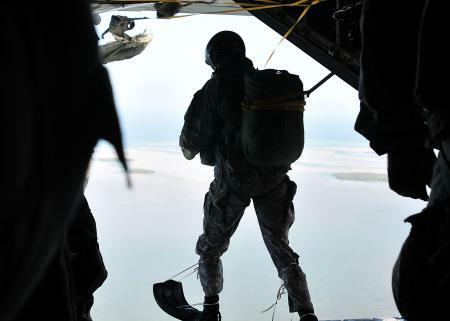 Green Berets are also trained in the conduct of airborne operations in a maritime environment; an operation more commonly referred to as 'water jumps'. All airborne units have Jumpmasters who plan, coordinate, and supervise airborne operations. To be a qualified jumpmaster you need to graduate from an Army Jumpmaster course. Part of the Jumpmaster Course is learning how to conduct a Jumpmaster Personnel Inspection or JMPI. This is a rigorous inspection to ensure that the parachute and associated equipment is donned properly. (Photo Washington Army National Guard). Read more about a Jumpmaster Course in "Jumpmaster Course Offers New Training Opportunity", Washington National Guard, August 2005. 3/20th Airborne Training Jump. This video shows 3/20th SFGA (Florida) conducting a helicopter static line parachute jump on 7 Feb 2013. Night Combat Equipment Jump with Ramp Bundle. 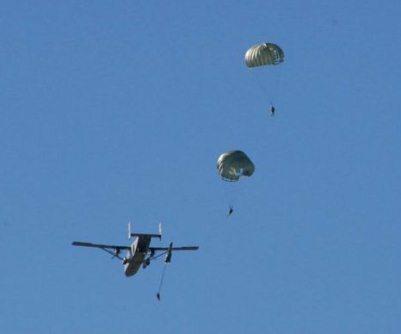 19th SFGA (California) conducts a parachute jump. What does it look like and sound like jumping from a helicopter? Watch this video of a 20th SFGA jump at Fort Harrison, Montana in June 2008. Video was taken by a jumper as he exited off the ramp of a CH-47. 197th Special Troop Company and 19th SFGA conduct day, ramp C-130H Hercules combat equipment jump in Utah. Military Free Fall Train-up. View a video of 20th SFGA Soldiers performing a HALO jump in preparation for an upcoming training exercise, Sep 11, 2012. C-23 Sherpa Jump by 19th SFGA Utah Army National Guard. Includes video of jumper with helmet cam. Military Free Fall. 20th SFGA Soldiers jumping from aircraft. March 14, 2012. Military Freefall School HALO. Video of Air Force CCTs attending Army Free Fall School at FBNC and Yuma Proving Grounds. Maryland 20th SF National Guard conducts free fall parachute jump from C-27J Spartan aircraft. November 21, 2011. C/5/19th SFGA from Texas National Guard (Camp Bullis) conduct water jump at Canyon Lake (Aug 14, 2010). 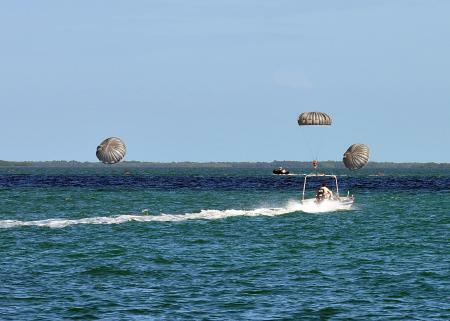 Florida 20th SFGA conducts day water jump from C-130. 5 minute video shows some of the coordination and planning needed for water jump. Video of various jumps by 19th SFGA at DZ Ashau, Camp Williams, Utah. Mississippi 20th SFGA exit CH-47 on ramp parachute jump. 19th SFGA water jump from UH-60 Corpus Christi, Texas 20 Aug 2011. 19th SFGA (California) HALO Jump - Nov 2010. Texas Army National Guard C-17 Jump - May 2011. UH-60 parachute jump by C/2/20th SFGA on Summers DZ, Camp McCain, Mississippi in honor of SFC Severin Summers in Fall 2012. In addition to staying proficient in airborne operations for their own infiltration capability Special Forces Operational Detachments conduct airborne training for and with other nations. Special Forces Airborne Training (1969). This video depicts SF trainers providing parachute training to CIDG Troops in South Vietnam. B/1/20th, in this video, conducts joint parachute operation with Moldovan Special Forces in February 2013 in North Carolina. 1. For more on MFFPC incorporation into SFQC see "Special Forces Qualification course to incorporate military free-fall training", Special Warfare Magazine, January - March 2013, Volumen 26, Issue 1, page 6.